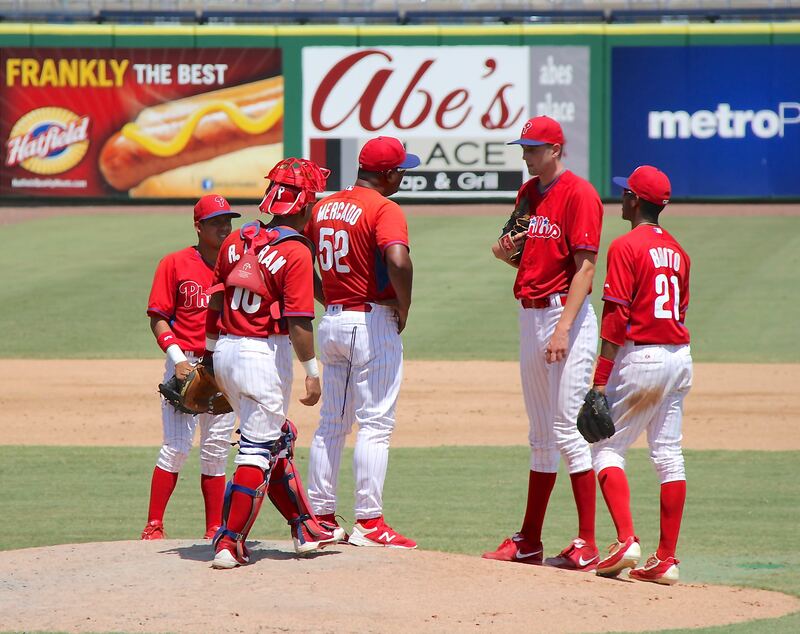 Kyle Young was your selection as the #22 prospect in the Phillies’ organization. Young received 51 of the 206 votes cast (25%). Francisco Morales finished second with 48 votes (23%), Daniel Brito finished third with 32 votes (16%), and J.D. Hammer finished fourth with 16 votes (8%). Eighteen others received the other 59 votes. Kyle Young was drafted by the Phillies in the 22nd round of the 2016 Amateur Draft out of St. Dominic High School in New York State. Mound visit during his 2016 playoff start. Coach Hector Mercado routinely pushed Young down the slope of the mound so that he could speak eye-to-eye, almost. Young spent his age 19 season pitching for Williamsport in 2017. He started 13 games and posted a 7-2 record. He posted a 2.77 ERA and a 1.123 WHIP. He walked 15 (2.1 BB/9) and struck out 72 (10.0 K/9). Young’s best game was a five inning, one hitter he threw in early July. He struck out a career-high 11 batters, walked none, and had a game score of 76. He went six innings three times including the last two games of the season. He threw 80-plus pitches 6 times and 90 pitches twice. 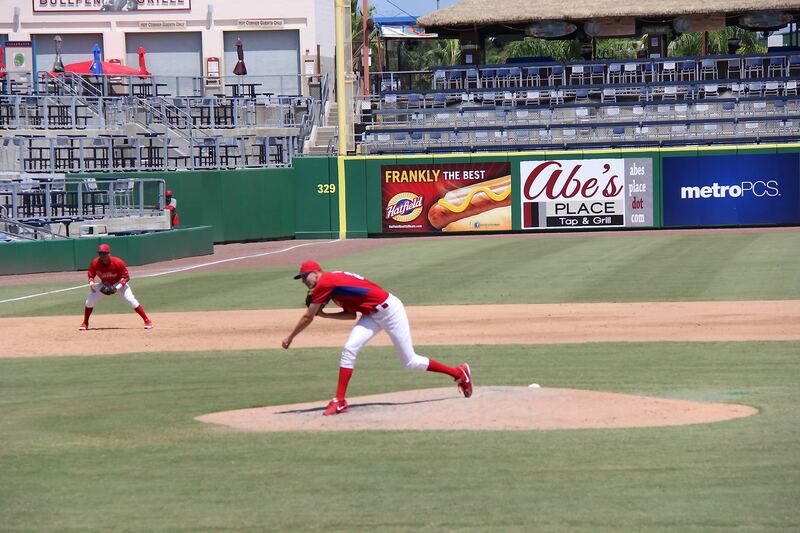 Young throws his fastball 87-90 mph. He throws an offspeed pitch that moves like a slider but has curve ball speed. He describes it as a slurve. It helps him get a lot of strikes at these lower levels. He usually gets double digit strikes looking, but recorded 20 swinging strikes in a late August game. Young was 6’10, 220 when he was drafted. He reported to camp in 2017 having grown 2 more inches. He told me he wasn’t worried that the added height would affect his delivery. He told me that he had an easily repeatable delivery. I watched closely during ST and XST. He does have a tight, almost compact, repeatable delivery. And, he lives in the bottom of the strike zone. He has a career 1.60 GO/AO. I spoke with him this week. He thinks he may have added another inch to his height. If true, it hadn’t affected his delivery when he pitched this week. It’s still as smooth as ever. Young’s advanced control (I’m not ready to say command, yet) should carry him to Lakewood this season. Next up is your selection for the #23 prospect in the organization. 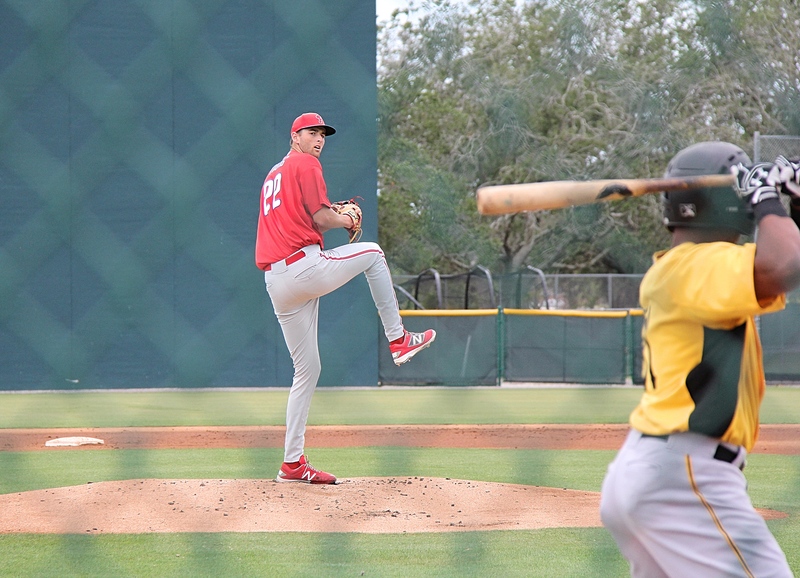 Looking forward to seeing Young at Lakewood, was impressed in the few times I saw him with the Crosscutters on Milb.tv. Going to be interesting to see what he does as he moves up. The randoming (is that a word?) of the names cracks me up. I’ve been voting for Morales for quite a while but every day he’s in a different spot. Sometimes on the bottom of the poll or in the case of this poll, right in the middle. Maybe randomizing should have been the word I was looking for. Jim – am I interpreting your commentary correctly in that Young is now 7’1? Maybe. I spoke with him last week and he mentioned that he had grown another inch, but he hesitated to confirm that he had reached 7’1 when I followed up. He said he’ll wait until his pre-ST physical to confirm his exact height. If Young could throw a little harder he could rocket up this list but at his current speed, I’m worried the higher levels won’t be kind to him. I agree. Hopefully with physical development he can sit in the low 90s. this velocity historically ( there are a few exceptions) results in bullpen specialists and back of the rotation starters for second division teams. i’ve been supporting Morales for a while now. He’s the high ceiling prospect that you are looking for. Another year will help him clean up his mechanics and the BB% will go down. A 18 yo 6’4″ projectable SP with mid-90s (potentially upper 90s) FB with a potential CB and a workable CU — he will be the farms top pitching prospect in 2 years and will be Top 50 is baseball. Murray, I watched Young (and about 12 other pitchers throw Friday). Young’s delivery looked a little different to me. It appeared that he was taking a longer stride toward the catcher. I just checked video from last spring, and it does look a little longer AND more consistently in the same landing spot. Can’t wait to get a radar gun on him. While he doesn’t throw hard that 7 foot frame probably adds a couple of MPH to what it looks like in the box base on his reach. More than likely his release point is a foot or so closer to the plate than any other pitcher. That being said, I’ve been voting for Brito for a while and will continue. I have a lot of others on my list ahead of Young and Leftwich. I think Morales might have better present stuff than Young, with room for projection himself. But it’s a lot of fun to think about what Young could be with even if he just gets his stuff to above average. Cole Irvin here for me. Puddinhead…..Irvin should get a taste of the majors, perhaps at the end of 2018. LHPs are always desired by manages to plug into their rotations. Irvin is another of the seemingly endless back of the rotation starting pitching options ( 4s or 5s) that we have at major league , AAA and AA level. The task for MK is to turn some of those into higher end talent via trades. it will be hard to convert a bunch back end starters or high floor to high end talents. as suggested by some of us here – one way to convert these high floor prospects is to trade at least a couple of them for a Comp pick and work around the overall pool dollars to draft a high ceiling prospect for over slot value. another way is to trust the scouting and player development teams. trade some of the cost controlled non-stud players/prospects for lottery pick type prospects in the low minors. HOU found some success in doing this strategy. also, MK can trade for addition bonus $$ in IFA and let Sal A. do his magic. anyone can do the easy work at that job. Irvin is a solid pick. Would rank him ahead of guys like Fanti and Young. Morales again. It’s about the ceiling. Apparently, proximity trumps ceiling in the eyes of many of our voters. Seems a lot of folks are high on #4’s and #5’s….??? There are no consensus parameters for voting. Next up for me is Victor Arano. The forgotten pitcher. Yeah, I have him in the mid-20s, just ahead of Seranthony Dominguez. He could be an 8th inning guy and he’s major league ready, though still retains prospect status. Note to Jim: need to remove Kyle Young from the poll! Thank you. I can’t explain his presence in the poll. He was NOT in the poll I created. Any votes that he received are not showing up in my results and were not counted. I re-embedded the existing poll into the text and that seems to have cleared his name from the poll above. I’m not going to invalidate this poll. Anyone who voted for Young after he was announced as the winner, well tsk, tsk. I’m going to leave this poll open for another 24 hours. I was surprised by the Young vote. He is now at a height which is unprecedented for a pitcher. I’ve seen so many very tall Phillies pitchers bomb out over the years. I do remember Reed playing both baseball and basketball. He was only 6′-5″. Randy Johnson was ‘only’ 6′-10″. At 6′-11″ Jon Rauch was the tallest pitcher ever in MLB, so it appears Young is 2 inches taller than that. Definitely an odd conversation starter, but very hard to repeat your delivery whey you’re that tall. Reed was certainly an asset. A guy you could count on for an inning or two. His BB rate doesn’t suggest control issues through two seasons, which would indicate to me some level of consistency in his mechanics. Someone on here said within the past few days that he has a fairly simple delivery. Drew Anderson. With his TJ surgery another year behind, he is poised to break out as a 24 YO starter in LV. Then, you’ll be happy to hear that he looked real good yesterday throwing with the other pitchers. He had good velocity and command, keeping his pitches down in the zone. More so than the others, it seemed. Not bad for an early workout. That’s good to hear. When I saw Anderson pitch last year, his stuff looked a lot like Justin DeFratus’s stuff, which is to say, just a touch above pedestrian. But it was one outing and I assume he must command more pitches than a relief pitcher like DeFratus. He has had a nice minor league career. It’s my assumption that Anderson’s stuff wasn’t as sharp last year pitching in a 5-man rotation compared to 2016 when Clearwater was using 6 starters. I think he’s probably a reliever in the majors but if he can rebound and his stuff looks more like it did with Clearwater then he might challenge for a ML rotation spot pretty soon. 2 time All Star means nothing I guess. It doesn’t really. What kind of player is Pullin likely to be if he does manage to carve out an MLB career? Greg Dobbs but limited to LF? 280 hitter with a 160 ISO He has 200 games at second base. Trade him to a team that needs a 2b that can hit.